In case you missed the first post on Cartier’s 2018 Santos de Cartier, consider this a must-read on the new iconic timepieces that are now in Cartier boutiques locally. And if you already read the first one, consider this your refresher then. 01 – First created in 1904, the last major update was the Santos 100 that was launched in 2004 to celebrate the watch’s 100th anniversary. 14 years on, the watch sees several new features, including sleeker and thinner blue dials instead of a silver opaline dial, as well as updated proportions that give the Santos de Cartier watch a dynamic fit on the wrist. 02 – You can find the watch in 4 main variations. Steel, Yellow Gold & Steel, Pink Gold and Yellow Gold (in order of pricing), as well as special versions known as the Skeleton with skeletonised bridges forming Roman numerals and revealing the mechanical movement within. 03 – Each watch comes with a matching bracelet. For example, the steel will come with a steel bracelet, while the yellow gold & steel version comes with a steel bracelet with 18K yellow gold screws. Adjustments are also simplified thanks to the SmartLink resizing system, which allows for the addition or removal of watch links in several easy steps that you can do by yourself at home. Every piece will also come with a second bracelet in calfskin leather where you can choose from a whopping 17 differing hues. Changing between the two bracelets is easy due to the QuickSwitch system that removes and attaches in a simple push of the mechanism. 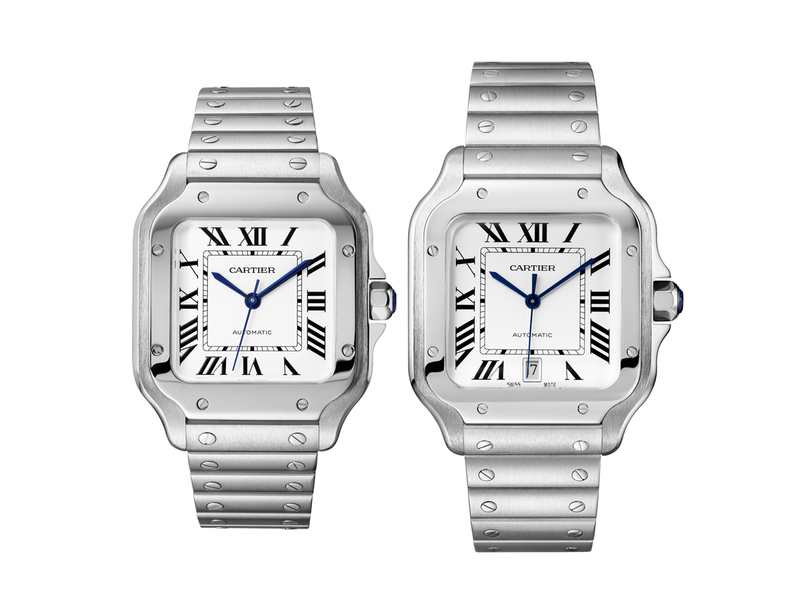 04 – There are only 2 sizes for the new Santos de Cartier, a Medium (35.1 mm by 41.9mm) and Large (39.8 mm by 47.5 mm), both of which have been precisely weighted and measured for comfort, sitting nicely on any wrist. 05 – You often hear of watches getting a price hike after the addition of several innovative details, or inflation through the years, but this is not the case for the Santos de Cartier. Instead, this 2018 version is powered by an automatic caliber 1846 MC in-house movement that has a power reserve of 42 hours and is water-resistant to 100m, but priced lower than its predecessor. For comparison’s sake, the Santos 100 Large in steel with a leather strap costs SGD9600, while the Santos de Cartier Large in steel with two straps and a date in the watch face retails at SGD9450. And if these 5 facts are not enough to pique your interest, Cartier has dedicated Level 1 of its Takashimaya Shopping Centre Boutique to showcase its Santos de Cartier timepieces in a display known as the Legendary Thrill. Now on till 10 June 2018, you can head on down and try the watches on yourself, which will definitely be more thrilling than watching your better half shop.